This past week, the American Federation of County, State, and Municipal Employees Local 3299, the largest employee union in the University of California, released a number of press releases leading up to the confirmation of a three-day strike. Scheduled for Oct. 23-25 by the University’s patient care technical workers and coalition of sympathizing parties, the protest will take place at all UC Medical Centers. The UC patient care technical workers of AFSCME Local 3299, which represents a total of 24,000 service and patient care workers on UC campuses and hospitals, approved of the decision by a 96-percent margin. Confirmed participation also included that of UC service workers, professional healthcare, research and technical workers represented by UPTE-CWA. This is the second state-wide strike of year. 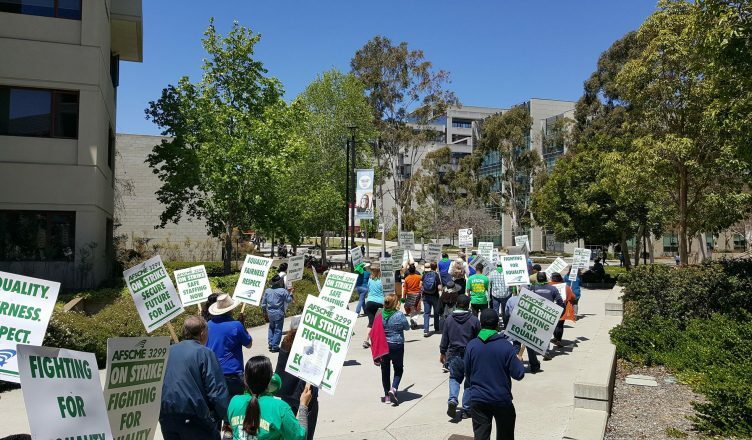 The first protest took place in May, when 9,000 UC service workers and more than 50,000 AFSCME members united to speak out against the UC system’ outsourcing practices and the rise in the socioeconomic disparity of many of the workers who often are from marginalized communities. AFSCME Local 3299 President Kathryn Lybarger spoke out on the prevalence of this concern. “When the UC outsources these jobs, [it is] eliminating what were once career ladders into the middle-class for women and people of color,… [which] is in major conflict with the University’s mission of serving as an engine of economic mobility for all Californians,” Lybarger said. AFSCME Local 3299 decisions leading up to last week’s vote come after a series of ongoing legal disputes and negotiations regarding the University’s unilateral implementation of labor policies. Meanwhile, the Public Employment Relations Board, a quasi-judicial agency that adjudicates disputes between public employee unions and most public employers, is mitigating the discussion of the two formally filed complaints — referencing the June 27 Janus ruling. Directed to the state Public Employment Relations Board, the union alleges the University to stymie access to data on new hires in violation of AB 119, and discouraging union membership in violation of SB 866. John de los Angeles, AFSCME’s communications director said that the UC system recently proposed its most updated offer to AFSCME’s 3299’s patient care workers in a similar version to the one addressed to the union’s service workers last spring. This offer, rejected by service workers, alloted a 3-percent wage raise instead of the 6 percent pushed by union workers to all positions involving patient care and a prorated payment of $750. AFSCME 3299 is still fighting for a freeze on health care premiums and job security against the risk of outsourcing its jobs to private contracting companies and the consequential loss of full-time benefits. “By ignoring the well-founded concerns of its frontline workforce, [the] UC [system] is eroding the quality of service that we provide to students, patients, and communities that depend on us,” Monica De Leon said in a communique issued on Oct. 12. De Leon is the vice president of AFSCME Local 3299’s Patient Care Technical Unit.